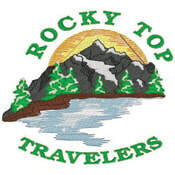 The Rocky Top Travelers, includes members from the eastern region of Tennessee, that includes Bristol, Chattanooga, Knoxville, and Crossville, Currently, it is the largest of our three chapters. With many of its members residing in The Gardens, an development designed for RVers in Crossville. RTT members often travels in groups. In 2017, the group selected Alaska for its summer trip. Join our chapter and enjoy any of the activities with us: camping, local tours, and theme celebrations. We are a group of individuals interested in using our Winnebago Industries RVs, visiting different areas, and just having some fun while enjoying the great outdoors. So whether you are new or well experienced with RVing, we know you will enjoy being a part of The Rocky Top Travelers. Please join us at any of our events. September 10 - 13, 2019 Creekwood Farm RV Park, Maggie Valley, NC. Ten sites (#19-28) have been set aside for our members and held until July 10, 2019. The daily rate for these sites is $47. Discounts for Good Sam, Triple A, Military are offered. A one night, nonrefundable deposit by credit card is required when YOU make your reservation. It will be applied toward your stay. You can arrive before and/or stay after the Campout. Creekwood Farm RV Park is located off I-40 East, Exit 20, Hwy 276 South, Maggie Valley, NC. There are many things to see and do in the Maggie Valley area: Elk, Wheels Through Time (collection of rare American vintage motorcycles), Waterfalls, Hiking, Elevated Mountain Distilling Co., Blue Ridge Parkway. Check out the Maggie Valley Visitor’s Guide Online at https://maggievalley.org/guide. Remember, YOU must make your own reservation by JULY 10, 2019. Phone: (828) 926- 7977. Tell them you are with Rocky Top Travelers. Once you have made your reservation, let one of the hosts know. We will send a schedule sometime in April or May.